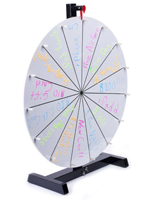 The prize wheel makes rewarding your employees or students an exciting experience. This game has 12 separate sections for users to offer up to a dozen different prizes. 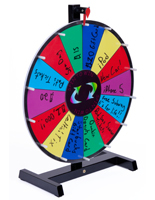 The prize wheel that uses wet-erase or liquid chalk markers on the surface is convenient for educators and office managers. A huge advantage of purchasing a prize wheel with an erasable surface is that you can update awards to suit any occasion instantly. 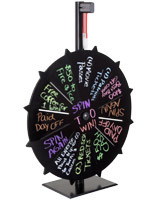 The prize wheel, also known as a carnival spinner, has a plastic flapper at the top of the unit to indicate what award is won after each spin. A hard plastic cover on the end of the flapper produces a clicking noise with each spin for added suspense! 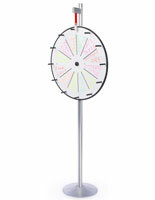 The carnival contest, prize wheel has a compact size which fits on tabletops and counters with ease. 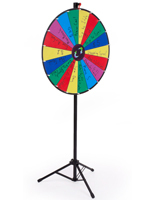 Unlike other spinning games made entirely from plastic, this custom promotional unit has a base and pole made from aluminum. 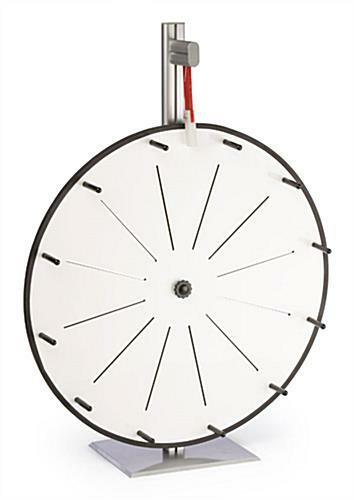 The prize wheel has a silver finish on the aluminum base and pole which provides an upscale look. 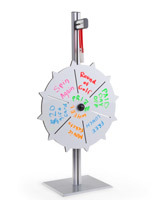 The game which spins is a great way to provide an incentive for achieving a certain goal. The prize wheel, also known as arcade classic, provides a reminder to employees that exceptional performance will be rewarded! 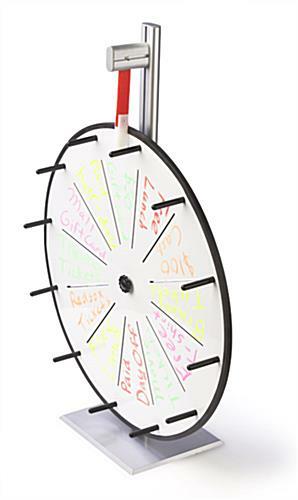 Customer Please Note: This game wheel is designed for use with the liquid chalk markers or wet-erase markers. We do not recommend the use of dry erase markers, as these may leave "ghosting" on your game wheel. 27.0" x 24.0" x 20.0"